2014 Kuberg Trex. Picture credits - Kuberg. Submit more pictures. 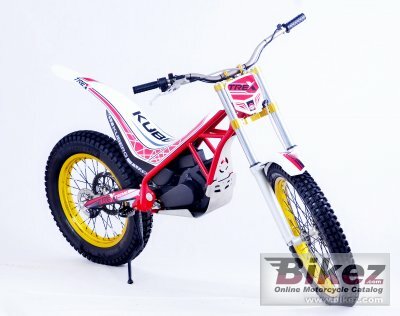 KUBERG TREX is an adult sized electric trial bike. This high quality bike delivers (in electric package) all you would expect from a top end adult trial bike. With up to 3 hours of range and 3 different power maps this bike is perfect for the varying skills between novice and expert riders. Front suspension: Hydraulic telescopic fork �40 mm with settings. Rear suspension: Steel swingarm, progressive linkage system, single adjustable shock absorber. Comments: 2 hour charging time. Intended for children. Range up to 1-2.5 hours. Lithium Polymer 48V 25Ah. Ask questions Join the 14 Kuberg Trex discussion group or the general Kuberg discussion group.